RENO -- Authorities say a knife-wielding Nevada high school student who was threatening other students is in critical condition after a campus police officer shot him. Reno Police Chief Jason Soto confirmed at a news conference Wednesday night that a school district officer shot the 14-year-old boy after he failed to follow the officer’s commands during the confrontation. Soto said when Reno officers arrived at the high school at about 11:30 a.m. Wednesday they discovered the student had been armed with at least one knife and had threatened other students minutes earlier. Soto said no one else was injured. He read from a statement at police headquarters and refused to take any questions. 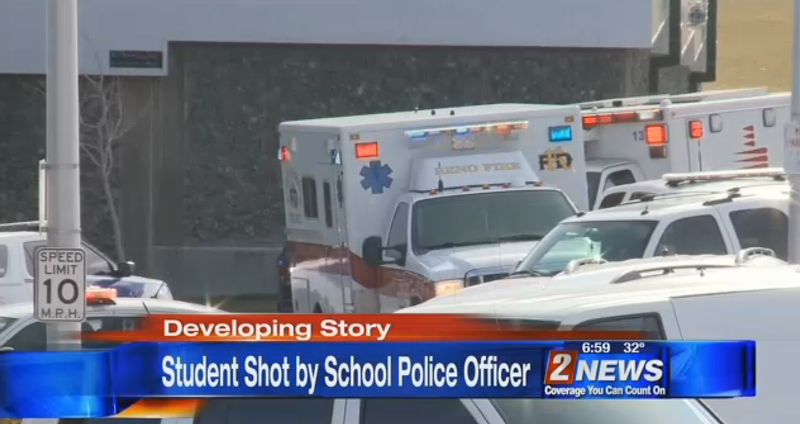 Washoe County School District officials said earlier the student who was shot was 16 years old. They say classes at Hug High School will continue as scheduled on Thursday. The incident happened just before 11:30 a.m. about the middle of the campus, during lunchtime, outdoors, CBS affiliate KTVN reports. RPD says that a 14-year-old male was armed with at least one knife and was threatening other students. Officials say a Washoe County School District Police Officer responded to the altercation and gave verbal commands. They say the 14-year-old did not follow the verbal commands and the officer shot his service weapon, striking the student. Authorities say the parents of the student have been notified, and he was transported to a hospital where he is in critical condition. The AP says the student went to Renown Regional Medical Center for treatment. Washoe County Sheriff’s Deputies are assisting Reno Police, along with state and federal law enforcement such as the FBI. Officials say that no other students or officers were injured, and the officer, who was involved in the shooting, will be placed on paid administrative leave per the Washoe County School District Police Department’s policy. A code red lockdown went into effect immediately after shots were fired at the school. One of our reporters on scene says a few students sent text messages to their parents informing them of the shooting. Many of the students said they were being kept inside classrooms during the incident. The Washoe County School District says an automated call was sent to parents informing them of the situation, and of the school lockdown.